Feeling A Little 'Bullish' On These Bucks ~ The Bucky Channel - The World of Sports from Wisconsin's Perspective. For the first time since November 2nd the Bucks had Bogut, Redd and Jefferson in the starting lineup. 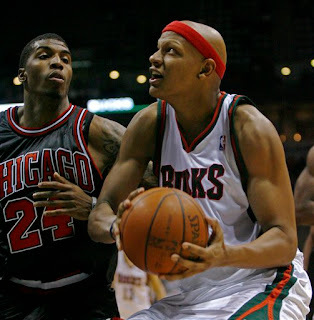 The Bucks(8-12) also pulled out a 97-90 win against the Chicago(8-11) Bulls Wednesday night at the Bradley Center. It was good to see the three on the floor together even if for some reason Skiles decided to start Malik Allen at PF. The team seemed to gel decently, especially in the 2nd and 4th periods when Bucks bench squad of Sessions, Villanueva, and Gadzuric took over. For the starters, Ridnour ended with a double double with a 12 points and 10 assists, Redd ended with 13 and Jefferson with 21. It was a quite night for Bogut who was back in action after a bruised knee but left in the 3rd after being hit in the face. He finished with 5 points. Want more stat-action? Check the Bizzle Sizzle. The real story came from off the bench tonight. CV had a phenomenal game off the bench, providing a team high 23 points and 10 boards to boot. Danny G contributed to 11 points, 3 blocks and 14 boards with 7 of the coming on the offensive end. This could prove to be a bench mark for success this year, no pun intended. Having a bench come on and completely dominate makes the Bucks a tough team to beat on any night against any team. Now I realize it was against the Bulls, and Bogut, Jefferson, and Redd need some more time getting comfortable together, but there is definite reason for some optimism here. The Bucks look for continued success Friday night at home against the Charlotte Bobcats(7-11). The game will tip off at 7:30 and will not be on FSN I guess, due to Badger hockey. TBC's Buck of the Game: Charlie Villanueva - It's gotta be CV! He just seemed to take over tonight in the 2nd and 4th quarters. 21 and 10 on 10-21 shooting, 'Don' money everytime.